H.E.R.O. – Metamorphosis follows the story of three people - Stephanie, Lance, and Rael. They find they are changed into supers, along with others in Metrocity, when a meteor shower unleashes radiation above the city. The friends discover that they become a psychic, a brick, and a mutant. They must cope with the changes to their everyday life, friends and college as they discover the new powers at their disposal. In the midst of trying to become heroes and dealing with the changes to their normal lives, a mutant villain captures many new supers in a bid to build an army for herself. At the current point in the universe, supers have existed for about twenty five years. The H.E.R.O. organization – the Homeland Extraordinary Response Organization – allows for a loosely operated environment for the heroes to operate without being vigilantes. H.E.R.O. - Metamorphosis is a full length novel with approximately 122,210 words. Following immediately after the events in H.E.R.O. 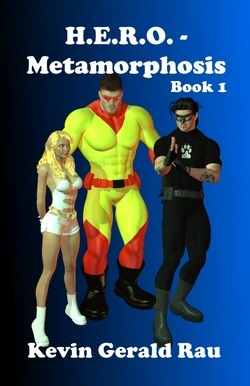 - Metamorphosis, Lance, Stephanie and Rael continue learning and developing their powers. A kidnapping leads them to become involved in the discovery of a new black market involving the capture and sale of supers. Other heroes become involved as some are kidnapped, others attempt to find and free them, and yet others stop crimes and a fire that occur along the way. A failed attempt to rescue some of the victims leads the group to bring in more established heroes in the form of Gatecrasher and Hellshock, and new hero Firebane joins the team in a final bid to save the victims before they can be auctioned off. H.E.R.O. - New Markets is a novel set in the H.E.R.O. universe. It explores the powers, life and interpersonal relationships in a way rarely seen in comic books or movies. It is a full-length novel of approximately 125,800 words. Diva: A former model, she is struggling to learn the ropes as a new member of the H.E.R.O. organization. Chrome: As her life shatters from the devastating change into one of the most powerful brick superhumans in Metrocity, she must learn how to cope with the terrifying realities of no longer being human. Gravitix: His story unfolds as he makes a decision for or against the use of power for easy gain and evil. Through their trials, a strange mutant uses her charm and wiles in an attempt to corrupt the new supers and aid her in freeing the bloodthirsty mutant followers she lost in H.E.R.O. - Metamorphosis. The story brings back many familiar faces from the first two novels in the series as we again interact with Psystar, Spartan, Black Tiger, Gatecrasher, Psycom and Silverlash. H.E.R.O. - Rise and Fall is a short novel of approximately 53,000 words. The H.E.R.O. series continues with its fourth novel. Aliens come to the Sol system to research the umbra - or dark energy behind the powers of supers both on Earth and elsewhere. Finding Earth unexpectedly populated, and after being attacked by another alien vessel, their starship is forced to land near Metrocity. The scientists decide to investigate some of the superhuman activity in the city while repairs are made upon their starship. Separately, researcher Cam Huntsbury leads a team in ongoing research on the meteorite involved in the mutation of humans into supers. An experiment goes awry, ending in a disaster for the research firm Fargene. A large number of supers in Metrocity become involved as the events occur, including Spartan, Psystar, Black Tiger, Diva, Gatecrasher, Razorwing and Rayna, among others. H.E.R.O. - Dark Research is a full length novel of approximately 106,000 words.